Famed aviatrix Evangeline Starke never expected to see her husband, adventurer Gabriel Starke, ever again. They had been a golden couple, enjoying a whirlwind courtship amid the backdrop of a glittering social set in prewar London until his sudden death with the sinking of the Lusitania. Five years later, beginning to embrace life again, Evie embarks upon a flight around the world, collecting fame and admirers along the way. In the midst of her triumphant tour, she is shocked to receive a mysterious - and recent - photograph of Gabriel. On the verge of a stilted life as an aristocrat's wife, Poppy Hammond does the only sensible thing - she flees the chapel in her wedding gown. Assisted by the handsome curate who calls himself Sebastian Cantrip, she spirits away to her estranged father's quiet country village, pursued by the family she left in uproar. 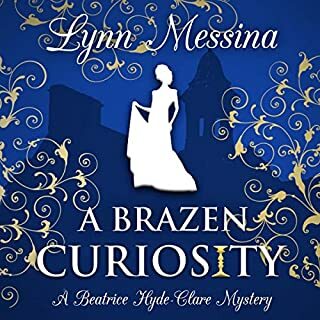 But when the dust of her broken engagement settles and Sebastian disappears under mysterious circumstances, Poppy discovers there is more to her hero than it seems. Against the frivolity of her peers, Ryder White stands in sharp contrast. As foreign to Delilah as Africa, Ryder becomes her guide to the complex beauty of this unknown world. Giraffes, buffalo, lions and elephants roam the shores of Lake Wanyama amid swirls of red dust. Here, life is lush and teeming - yet fleeting and often cheap. Amidst the wonders - and dangers - of Africa, Delilah awakes to a land out of all proportion - extremes of heat, darkness, beauty, and joy that cut to her very heart. Only when this sacred place is profaned by bloodshed does Delilah discover what is truly worth fighting for - and what she can no longer live without. 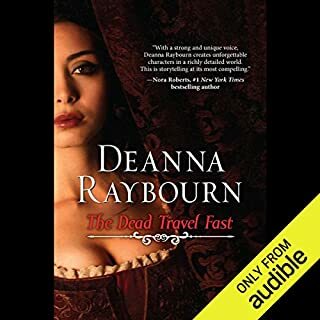 ©2013 Deanna Raybourn (P)2013 Audible, Inc.
Fun story, excellent narration. I'd prefer it without the steamy romantic interludes, but otherwise, a nice diversion. I think the Lady Julia Grey novels are brilliant. This book had NONE of the wonderful aspects of those books. What came to mind in this book was the movie Out of Africa. It was well written but frankly boring, not one of the characters was likable. If you are reading this because of enjoying the Lady Julia Grey novels this is NOTHING like those at all. Very disappointed to say the least. I did the whispersinc ebook/audio. The audio reader, Nicola Barber was excellent but the material was lacking. 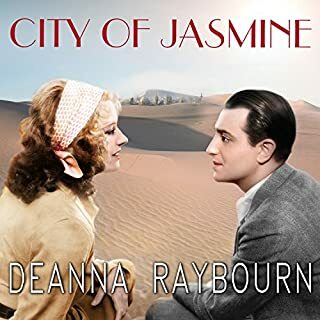 This book is about a bright young woman, Delilah, who elopes immediately after her court presentation, marries for love and enjoys learning "not to burn the chops" while her young man writes his book. He does not survive World War I. Like many of her generation, faced with the harsh lessons of the shortness of life and the brutality of war, she joins her wealthy relatives in the glittering whirl history describes as" he lost generation". The problem is Delilah parties to the point that she manages to discomfort even her most outrageous relatives. She is sent to what is now Kenya, until society finds someone else to gossip about. I settled into this story expecting to have a fun listen to get me through a rainy afternoon and some mindless work. But I just would not spend much time with this particular main character, because her careless attitude toward life seems to have extended to people who do not have her wealth. She is witty and interesting, but her treatment of the poor relation forced to be her companion/maid is not funny. If the poor woman is meant to be a foil for this representative of the lost generation, it doesn't quite work. There is not even a suggestion that the companion is someone who is hated, like Jayne Eyer's aunt hates Jane. Our flapper is just carelessly hurtful, and just a touch mean without even intending to be cruel. If I had to spend much time around this woman, it wouldn't take a sea voyage to make me throw up. I think I would toss her luggage overboard and find a soup kitchen. 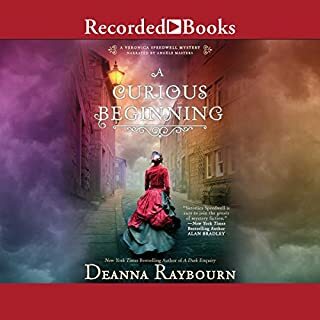 This is sort of an indication of how well Deanna Raybourn writes, because she has created two characters so real: I want to tell one of these women to get some self-respect and the other I just want to avoid. So I avoided Delilah and downloaded another book. I may regret it later, because many people have found this book to be fun. 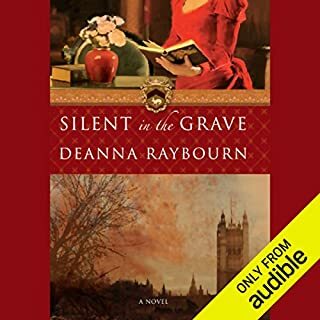 I couldn't stop once I started this captivating audiobook! I've lived in Africa myself and loved the descriptions of Kenya in the 1920's. The story's romance is exciting and the ending unpredictable but satisfying. 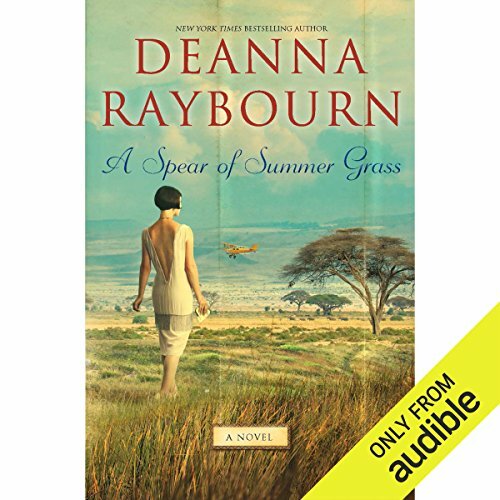 Nicola Barber is an excelent narrator, If you enjoyed the book or movie, "Out of Africa", you'll love "A Spear of Summer Grass." 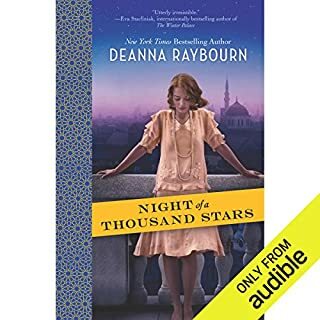 I hope Deanna Raybourn writes more books about the main character, Delilah! Quite romantic. A taste of Africa and of that time. I enjoyed the personal development of the main character. All the characters were clever. The narration very pleasant. What did you love best about A Spear of Summer Grass? This tale of a privileged woman sent to Africa is descriptive in the finest sense. This writer has the gift of descriptive narrative that takes the listener out on the plains of Africa and brings the lush landscape and exotic culture to life in the minds eye of the listener.The narrator has tones of a woman used to her own way which enhances the story. A marvelous read. I love stories featuring spoiled brats whom, through a series of humbling and trying experiences, evolve into conscientious, worthy characters. Ultimately, Delilah's smart strength left me smiling, despite the sadness and strife she endured. I recommend reading this one. Far better than I expected for a Harlequin! I was pleasantly surprised by this book. I read it for a book club and didn't have high hopes, given that it was a Harlequin book. However, the story was very engaging and had a feminist sensibility to it and the characters were well drawn, complex and interesting. Very enjoyable!